Barack Obama won re-election to the White House tonight with a landslide victory over Mitt Romney, according to projections from most of the television networks. Broadcast networks called the 2012 presidential election for Barack Obama as he swept the map with wins in the swings states of Ohio, Iowa, Wisconsin, Pennsylvania, New Hampshire and Virginia while Florida still hung in the balance. Barack Obama seemed poised for a resounding electoral college win – despite predictions of one of the tightest finishes in history and the dogged insistence of Mitt Romney advisers that they were making gains all over the political battlefield. Despite unemployment standing at 7.9% and Barack Obama performing very poorly during the first presidential debate, Mitt Romney was crushed nationally, though he might finish only just behind in the popular vote. 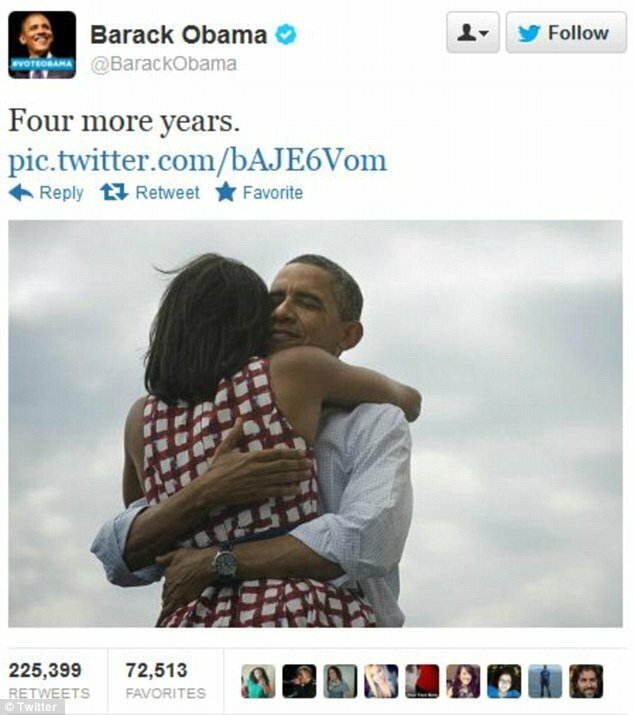 He also posted a picture of himself embracing his wife Michelle Obama – and the post rapidly became the most popular tweet of all time. Mitt Romney called Barack Obama to concede defeat shortly before 1:00 a.m., a few minutes before he was set to take the stage at his Boston headquarters to deliver his concession speech.